BlytheLife.com » Are you a new(ish) crafter, customizer or blogger? Are you a new(ish) crafter, customizer or blogger? In 2011 I did a March Talent Showcase and this year I want to do the same thing! March 2012 will be a month of showcasing new talent in the dolly community. The only qualifications there are that you have to have been doing whatever it is that you do for one year or less. It’s all about showcasing you and what you do; and to also introduce the readers to new talent in the community, which I think is an important thing to do. In March 2011, I showcased a new customizer, a fabric designer, a clothing shop and a fun handcrafted headband maker. I hope to do something similar this year by showcasing a variety of new talent. Belarus and I would love to do an interview with you! The interview process is really simple and takes place via email. Most interviews are 9-12 questions long and you can send me whatever relevant photos you want included (if photos are not taken by you, please get permission from the photographer[s] prior to sending me the photos with links to photographers). If you are interested, please head over to the How to Get Featured page and let me know! Please include links to any blogs/sites/shops/pages that you want me to look at so I have an idea of what to ask you and be sure to mention that you want to take part in the March Blythe Talent Showcase! March Talent Showcase: Seeking Interviewees! March Talent Showcase: Looking For You! 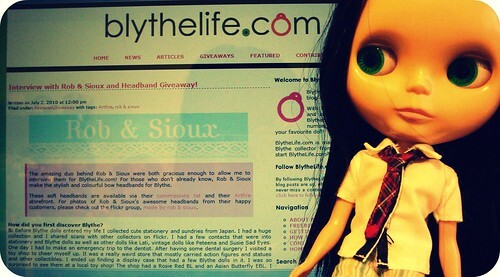 Are you new and talented in the Blythe Community? Would a new Blythe photographer be eligible?